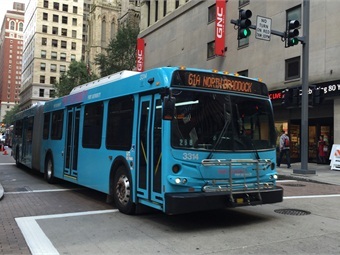 PITTSBURGH — A Port Authority of Allegheny County bus driver denied that she was racing with another driver when her bus swerved off Interstate 279, went through a guardrail, down a hill and landed on its side on Evergreen Road, the Pittsburgh Post-Gazette reports. While on trial for criminal charges, the driver, Juliann Maier, who suffered a broken pelvis, four broken ribs and lost her job, said that she “couldn’t control the steering” of her bus because of a mechanical problem. Prosecutors, however, have presented evidence they say shows the drivers were jockeying for position when the rear of Maier’s bus struck the other bus causing her bus to veer out of control. The drivers face multiple charges, including reckless endangerment and reckless driving in a non-jury trial. For the full story, click here.